I’ve been going over a lecture and Q&A Warren Buffett gave at the University of Florida back in 1998. During the Q&A, Buffett discussed some the first things investors must learn early on. After reading the transcript, three things jumped as nice reminders worth sharing. Buffett made the first one obvious. I think the other two fit with it. Learning all three early on will help avoid a lot of mistakes down the road. Well yeah, I’ve got no idea where the market is going to go. I prefer it going down, but I have – my preferences have nothing to do with it. The market knows nothing about my feelings. That is one of the first things you have to learn with a stock. You buy 100 shares of General Motors. Now all of a sudden you have this feeling about General Motors. I mean, If it goes down, you may be mad at it. You may say, “Well, if it just go up to what I paid for it, my life will be wonderful again.” Or if it goes up, you may say how smart you were and how you and General Motors have this love affair. You’ve got all these feelings. The stock doesn’t know you own it. Stock just sits there. It doesn’t care what you paid. It doesn’t care that you owned it or anything. So any feeling I have about the market is not reciprocated. I mean, it is the ultimate – it is very cold shoulder we’re talking about here. And anybody that is going to be a net saver – practically everybody in this room – is more likely to be a net buyer of stocks over the next ten years than they are a net seller. So every one of you should prefer lower prices. I mean, you’re going to be a net eater of hamburger in the next ten years, you want hamburger to go down, unless you are a cattle producer. And if you’re going to be a buyer of Coca-Cola and you don’t own Coke stock, you hope the price of Coke goes down. I mean, you’re looking for it to be on sale this weekend at your supermarket. You want it to be down on the weekends, not up on the weekends when you attend the supermarket. The New York Stock Exchange is a big supermarket of companies and you’re going to be buying stocks. What do you want to have happen? You want those stocks to go down, way down. And you will make better buys, then. And later on – 20 years from now, 30 years from now – when you’re in a period when you’re dissaving, or when your heirs dissave for you after you’re gone, then you may care about higher prices. But I find people – that was one of the – there’s a chapter 8 in Ben Graham’s Intelligent Investor about the attitude toward stock market fluctuations. That and the chapter 20 on the margin of safety, are the two most important essays ever written on investing, as far as I am concerned. Because when I read chapter 8 when I was 19, I figured out what I just said but it’s obvious I didn’t figure it out myself though. It was explained to me. I’d probably gone another 100 years if I hadn’t read and still thought it was good when my stocks were going up. We want things to go down, but I have no idea what the stock market is going to do. I never do. I never will. It’s not something I think about at all. When it goes down, I look harder at what I might buy that day because I know there’s more likely to be some merchandise there that I can use my money effectively in. It helps to understand what you invest your money into. If it’s a stock (index fund), then you’re a part owner of a business (basket of businesses). Buffett mentions chapter 8, which is a reference to Ben Graham’s parable of Mr. Market. Mr. Market will throw out some crazy prices for the shares businesses at times. Sometimes the price will be close to the value of the business and other times it will be way off. So while the price of that business may bounce all over the place, the value of that business is tied to its ability to earn money. You want to buy access to those earnings at a discount, just like you would hamburgers. And if you add a margin for error (Buffett’s reference to chapter 20, Margin of Safety) into the price you pay, you can limit your losses in case you’re wrong. Well what’s the benefit of being an out-of-towner as opposed to being on Wall Street? I worked in Wall Street for a couple of years and I like – I’ve got my best friends, actually, on both coasts. And I like seeing them. And I get ideas when I go there. But the best way to think about investments is to be in a room with no one else and just think. And if that doesn’t work, nothing else is going to work. And the disadvantage of being in any kind of a market type environment – Wall Street would be the extreme – is that you get over-stimulated. You think you have to do something every day. The Chandler family paid 2,000 bucks for this company [raises his can of Coke]. You don’t have to do much else if you pick one of those. And the trick then is not to do anything else. Even not to sell at 1919, which the family did later on. So what you’re looking for is some way to get one good idea a year and then ride it to its full potential. And that is very hard to do in an environment where people are shouting prices back and forth every five minutes and shoving reports under your nose and all that. 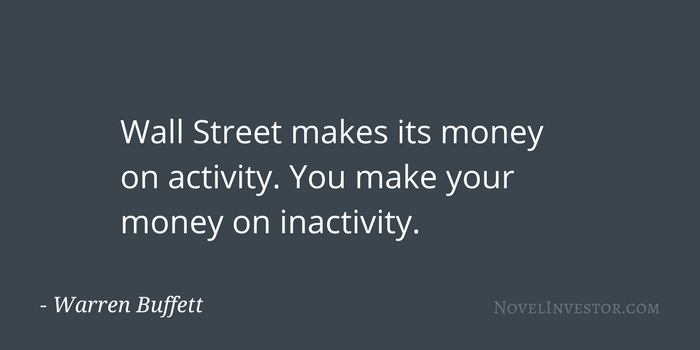 Wall Street makes its money on activity. You make your money on inactivity. I mean, if everyone in this room trades their portfolio around every day with every other person, you know, you’re all going to end up broke and the intermediary’s going to end up with all the money. On the other hand, if you all own stock in a group of average businesses and just sit here for the next 50 years, you’ll end up with a fair amount of money and your broker will be broke. So his activity is – he’s like a doctor who gets paid on how often he gets you to change pills, I mean, basically. I mean, he gives you one pill and it cures you the rest of your life, he’s got one sale, one transaction, and that’s it. But if he can convince you that changing pills every day is the way to great health, it’ll be great for him and the prescriptionists and you’ll be out a lot of money. You won’t be any healthier. You’ll be a lot worse off financially. So you want to stay away from any environment that stimulates activity and Wall Street would have the effective of doing that. I used to – when I went out to Omaha, I’d go back once every six months. I’d go back with a whole list of things I wanted to check out, companies I wanted to see. And I would get my money’s worth out of those trips, but then I would go back to Omaha and think about it. Taking time to think about potential investments is important. Not being influenced to act after you’ve made a decision is just as important. Part of that is temperament. Part of that is knowing what information is worth paying attention to. And part of it is knowing how to use that information wisely. But it starts with learning how to filter out the noise. I don’t think about the macro stuff. You know, I just – the important – what you really want to do in investments is figure out what’s important and knowable. If it’s unimportant or unknowable, you forget about it. What you talk about is important but, in my view, it is not knowable. Understanding Coca-Cola is knowable or Wrigley or Eastman Kodak or anything. You can understand those businesses. That’s knowable. And whether it turns out to be important depends on where your valuation leads you and the current price and all of that. But we have never either bought a business or not bought a business because of any macro feeling of any kind. We don’t read things about – predictions about interest rates or business or anything like that – because it doesn’t make any difference. I mean, let’s say in 1972 when we bought See’s Candy, I think, maybe, Nixon put on the price controls a little bit later – let’s say we’d seen it. But so what. We’d have missed a chance to buy something for $25 million that is earning $60 million pre-tax now. We don’t want to pass up the chance to do something intelligent because of some prediction about something that we’re no good on anyway. So we don’t read or listen to or do anything in relation to macro factors at all. Zero. And the typical investment counseling organization goes out and they bring out their economist and they trot him out and he gives you this big macro picture. And they start working from there on down. In our view that is nonsense. If Alan Greenspan was on one side of me and Bob Rubin on the other side and they were both whispering in my ear exactly what they’re going to do the next twelve months, it wouldn’t make any difference to me in what I would pay for Executive Jet or General Reinsurance or anything else I do. Being able to filter out the noise is an immensely useful skill. Removing all the predictions and conjecture in the market – all the unimportant and unknowable stuff – will lead to better decisions. Following the journey to learn all three will make you a better investor.